Home of the Hauge, Delft, Leiden and Rotterdam, the province of South Holland is a cultural Paradise. 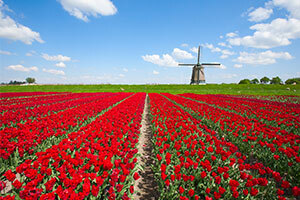 Perfect for families and couples a like, a visit to South Holland has something to offer everyone. Whether it’s perusing art and history in the outstanding museums, cycling through the flower fields in spring or sampling some local culinary delights – South Holland has it all! Duinrell Theme Park We think Camping Duinrell is one of the best campsites in Holland – not least because it has its very own theme park, with lots of fun rides and a tropical waterslide complex. Amsterdam When you’re camping in Holland, don’t miss the chance to take a day trip to Amsterdam. Highlights of this wonderful cosmopolitan city include the Van Gogh Museum, a visit to Anne Frank’s house, and of course, a trip on a canal boat. The Rijksmuseum recently reopened following a five year, multi-million pound renovation project. Den Haag Right on the doorstep of our campsite, Den Haag has an amazing 30 museums. As well as being the home of the Dutch royal family and government, and many international organisations, it has an enormous wealth of cultural sites and institutions. It’s also a great place to learn to surf! Hoge-Veluwe National Park A little further afield, the De Hoge Veluwe National Park comprises more than 5,000 hectares of diverse habitats, including woodland and heath, peat bogs, and drift sand. There are nearly 500 plants species and the animals on view include deer, wild boar and Corsican sheep. You can explore using the marked rambling routes, or choose from a huge range of bikes available for hire, including wheelchair bikes, tandems, and cargo bikes for carrying small children. There is also a fleet of simple ‘white bikes’, which are free to use. Delft Less than half and hour from our campsite, the city of Delft makes camping in Holland an attractive destination for weekends away. The world famous Delftware blue pottery is still made here: for a unique souvenir, they’ll even make you a plate or some tiles with your photo on. The painter Vermeer spent most of his life in Delft and following one of the Vermeer walks is a great way to get to know this atmospheric old city. Rotterdam Rotterdam is a cosmopolitan city that prides itself on its architecture and cultural life. There’s a surprising number of attractions for children, including the Blijdorp zoo, the Pancake Boat (all the pancakes you can eat! ), and the Kids Marina, where they can become captain of a real (kid-sized)vessel. Enjoy the panoramic views from the Euromast, and the amazing variety of shops. To find your perfect campsite in the South Holland please use our interactive site finder, call our knowledgeable customer advice team on 0345 268 0827, or go straight to the individual campsite pages.